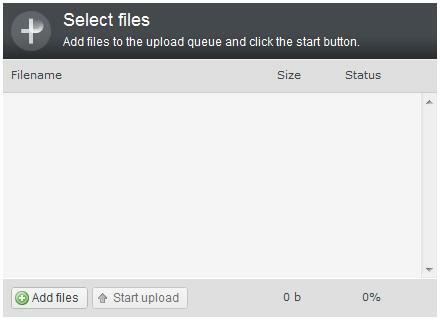 This article shows how to use the open source plupload control to upload multiple images. The images are resized on the client side before uploading and the upload is done in chunks. I had to provide a way for users to upload a lot of pictures. The problem was that pictures were being taken with 12-16 mega pixel cameras at 4000x3000 resolution so the picture files were huge(>5MB). This made it prohibitive because it would take ages to upload even 50 pictures for server side processing hence I had to find a way of resizing the images on the client BEFORE upload to the server. In my search, I came across the open source plupload control which provides a brilliant upload functionality with progress update and client side resizing. The only problem was that all the samples were in PHP, so it took me some effort to get it working with ASP.NET. I am writing this article to help others who want to use this control in ASP.NET. The control can be downloaded from http://www.plupload.com/index.php. Once you unzip the contents to your project folder, you would need to provide two pages. One page needs to be an ASP.NET page while the other one can be either ASP.NET or simple HTML. You need to make sure that the paths of other files being referenced in the markup are correct. For example, "flash_swf_url: 'js/plupload.flash.swf'," needs to point to the correct location of the swf file. Also, "url: 'upload.aspx'" is the address of the page which receives the uploaded files. I have a page called "upload.aspx" in the same directory as the above page so I simply provided the relative path of the page. This page creates the session, and the temporary directory where the uploaded images will be saved. When a file, or a chunk of a file is uploaded, the Request.Form collection contains the current chunk number, number of total chunks, and the name of file. If the chunk is 0 (first chunk), we create the file. If the chunk is greater than 0(chunk of existing file), we append that chunk to the existing file. Finally, the code behind for the page that is hosting the upload control contains the code for Submit button. In my original page, I have other controls and code to do some database work but I have stripped that code out for this example and kept it simple. lblMessage.Text = "You don't seem to have uploaded any pictures." Dim Path As String = "\\servername\foldername\"
" Pictures") & " Saved!" When the submit button is clicked, details of all the uploaded files are sent in the Request.Form collection. The code then loops through this collection to process each file and move it from the temporary folder to a share on a server. This example only deals with the Flash runtime of the plupload control. The control also provides Silverlight, Google Gears, Browser Plus, HTML5, and HTML4 runtimes but those are beyond the scope of this article.